If you read last week’s Takeaway Tuesday, you knew already that the Titans had an excellent opportunity to improve their RPI rankings. 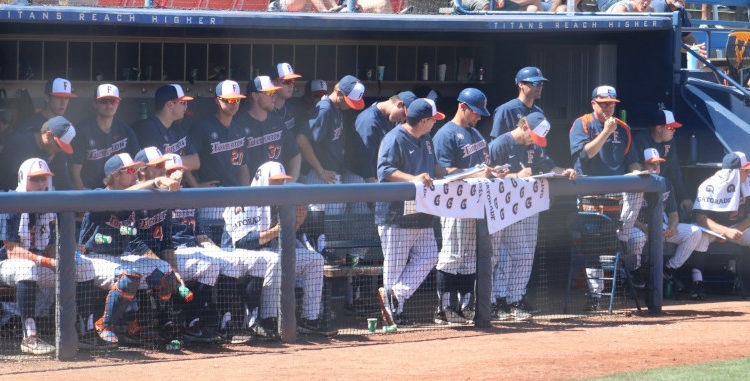 Pepperdine and UC Santa Barbara were both ranked within the top 25 in RPI. Unfortunately the Titans did not take advantage of that opportunity and recorded a 1-3 record with only the Saturday night win over UCSB. Titans are 1-2 to start Big West Conference play. Good news is that there are still a lot of conference games to be played by all teams. Titans have another golden opportunity this weekend to play the only undefeated team in the Big West, the Cal Poly Mustangs. Cal Poly went 3-0 vs. Cal State Northridge this weekend and is the only team with an unblemished conference record. Normally Goodwin Field is a tough place to play for opponents. Apparently not this year. The Titans are better on the road (4-3) and at neutral sites (4-2) than at home. A 4-8 W/L record home is not what you want this deep into the season. Add to that, the UC Santa Barbara Gauchos series win this past weekend was the first series win in Fullerton since 2007 for UCSB. Kameron Guangorena looks to get a lot more time behind the plate with the recent injury to Daniel Cope. 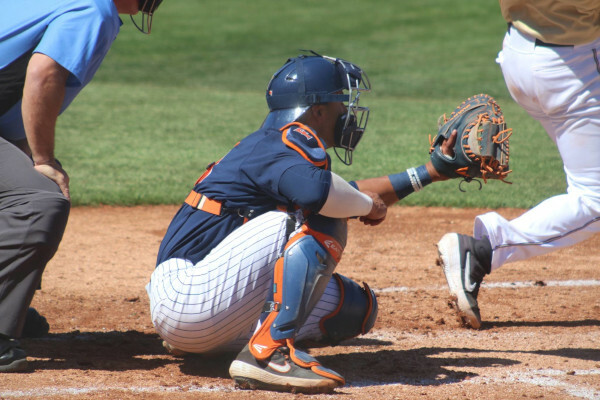 With Daniel Cope breaking his right index finger while attempting to bunt in the James Madison series, Kameron Guangorena has been holding down the catching duties ever since. 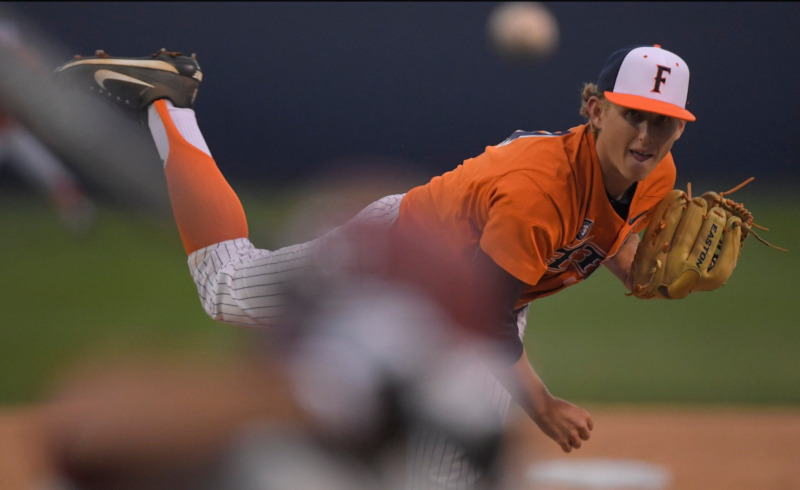 Although a junior, Cope was the veteran presence in the Titans battery with all three weekend starters underclassmen. Friday starter Tanner Bibee is a sophomore, Kyle Luckham has settled into the Saturday night role and is a freshman. Freshman Michael Knorr has been starting on Sundays since the season started out in Arizona. Add to it that Michael Weisberg is a freshman and looks to have locked down the closer role for this year and potentially the following two years. 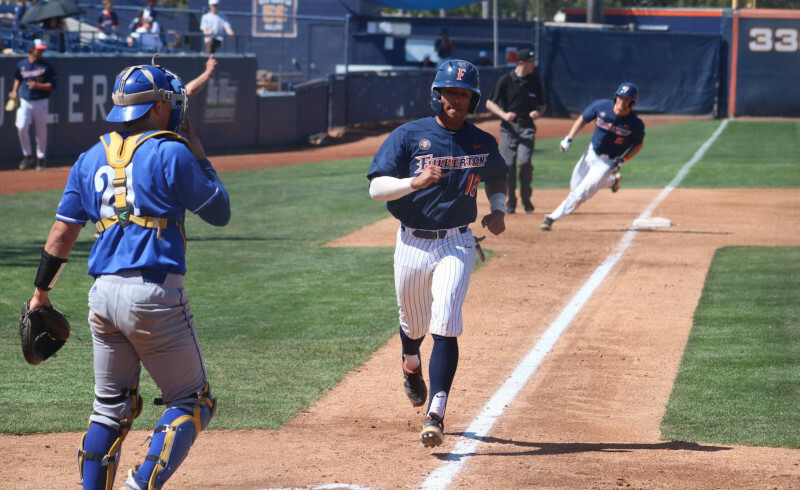 Heading into Sunday’s rubber match game against UC Santa Barbara, the Titans had not lost a game on Sundays. That all changed with the 8-7 loss. Prior to the loss, the Titans had beaten Virginia, Oklahoma, Stanford, New Mexico, James Madison and Long Beach State, all on Sundays. 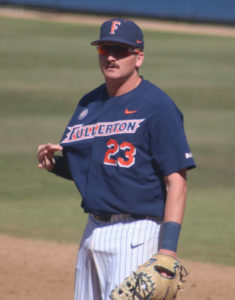 The win on Saturday over Santa Barbara was the first win on that day of the week since the previous week at Long Beach. Previous Saturdays, the Titans took losses from Vanderbilt, Fresno State, New Mexico and James Madison. It must be easy to get into the coaching staff’s doghouse and even harder to get out of it. 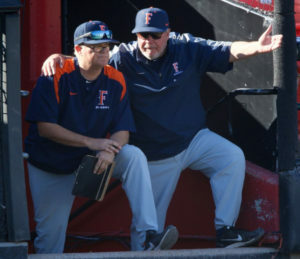 It is no secret that Rick Vanderhook uses the non-conference schedule to get a feel for his team and to discover which pitchers he can trust. Titan fans at Goodwin on Friday were scratching their heads and asking, “who’s this guy?” when the walk-in mariachi music for Mathew Sanchez announced he was coming in for relief. 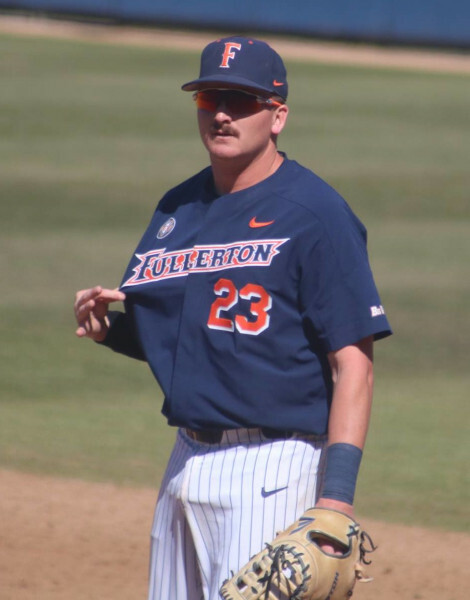 Those fans that did not make the trip to Arizona for the MLB4 Tournament were seeing Sanchez, a transfer from Citrus College, for the first time. After making a boneheaded pick off move in the Vanderbilt game, Sanchez was banished to the bullpen for 20+ games before coming in Friday night. Sanchez apparently learned his lesson about ill-advised pick off attempts because he didn’t have to try to throw anyone out on first. He promptly went out and faced nine batters, retired them all and struck out seven of them in the process. You can make bad pick off attempts if you don’t let anyone get on base. If only the bullpen sentence could have been a little lighter given how the season has gone. On Saturday, Titus Groeneweg relieved and threw two shutout innings and left after giving up a hit to start the 9th inning. Groeneweg was apparently serving another 20 game sentence in the bullpen after relieving against Vandy and giving up three earned runs on three hits. Groeneweg pitched a scoreless inning at New Mexico and against James Madison in the interim between the Vandy game and Santa Barbara. UCSB was only the second game since February when he was allowed to pitch more than an inning’s worth of batters. Freshman Joe Magrisi apparently had a better lawyer than the other two and got paroled faster to come in Sunday to toss 3 1/3 shutout innings. 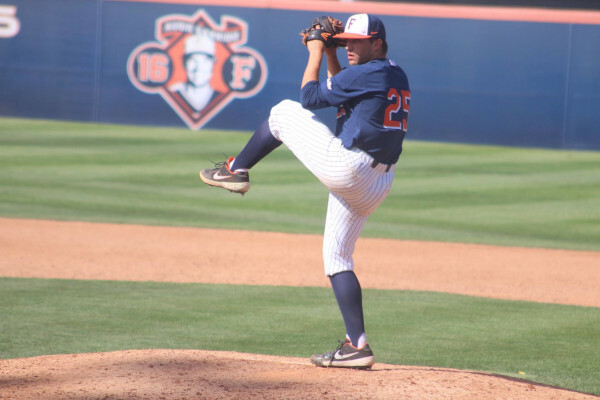 After his disastrous start at USD, Magrisi got an inning appearance vs. Pepperdine and came out unscathed. Magrisi is more of a workhorse starter than a reliever so we would expect to see more of him as a mid-week starter since the weekend spots appear to be already sorted out. That’s how many pitches Tanner Bibee threw on Friday vs. UC Santa Barbara. Normally 100 pitches is the magic pitch count number for major league pitchers when managers yank them off the mound. That is for Major Leaguers who are grown men who have years of experience under their belts. Bibee, a sophomore and less than two years removed from playing high school ball, threw 121 pitches Friday. Headed to the sixth inning, Titans only trailed 3-1 and the game was within reach. Bibee gave up two singles to open the inning and then after a sacrifice bunt, the scoring began. A sac fly brought in Christian Kirtley to make the game 4-1. Next on deck was Eric Yang who will probably be named the All-Big West catcher at the end of the year. Behind Yang was Tommy Jew who is poised to be named Big West Player of the Year. Hindsight is 20/20 but Yang launched a 2-run blast and Tommy Jew followed it up with a solo bomb. Score 7-1 and Bibee was left out there to record the final out of the sixth inning. Were Hook and Rousey leaving him out there just in case the Titans scored seven runs in the bottom of the sixth to get Bibee the official game and the win? Seems a bit ridiculous but so is having a sophomore throw 121 pitches. Adding to the insanity is that Sanchez came in and mowed down the Gaucho line-up for three scoreless innings. Same could be said for Michael Knorr on Sunday who was clearly laboring after the fifth but was still brought out to start the sixth. Knorr faced two batters and promptly gave up a single and an RBI double. He threw 88 pitches before getting lifted. Going back to the mid-week game vs. Pepperdine and the decision to go to Gavin Velasquez was questionable too. Having Timmy Josten pitch three innings on Tuesday is understandable because you want to save his arm and have him available over the weekend. But to bring in Gavin Velasquez and he gets tagged with seven runs, all earned, after he pitched on both Saturday and Sunday leaves us with questions. Where was Evan Larsen? What about Jimmy Endersby? Both of those guys have been off the radar and were more rested than Velasquez. These young arms are good and powerful but let’s not burn them out so quickly. You’ll not only lose games but could possibly lose them for the year if they throw too much and don’t have anything left in the tank for a potential postseason run. 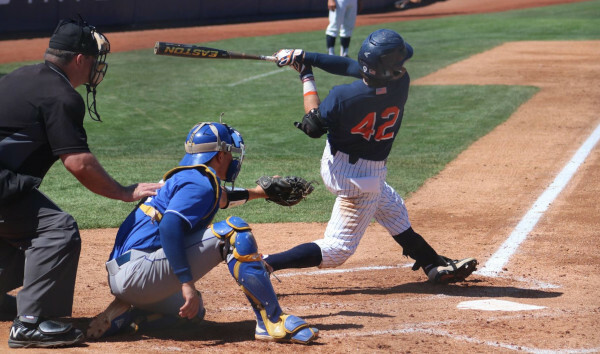 Isaiah Garcia was the first of three Titans to homer on Sunday vs. UC Santa Barbara. The Titans home run total for the season so far is nine. Three of those nine came on Sunday. To round out the power display, AJ Curtis crushed the first homer of his D1 career since transferring from Ohlone Junior College. Despite the homers, it was not enough and the Titans lost Sunday’s game and slipped below .500 for the season. Stop me if you have heard this one before. A Titan player is now sidelined with a broken finger after trying to bunt. Second verse, same as the first. Over the weekend, Jake Pavletich broke his finger while attempting to lay down a bunt. Almost a carbon copy of the same injury to Daniel Cope that is keeping him from catching for a few more weeks. Unlike Cope who is batting .277, don’t expect to see Pav in the DH spot with a splint on his finger. After starting the season on a tear, Pav’s bat has been ice cold. His batting average is hovering around the Mendoza line. Curtis has been seeing some time in the DH spot when the Titans face left handed pitchers. He has not seen that much time at first base because Pav’s defense has been quite good over the years and Curtis was still in the process of recovering from a hamate bone injury. It looks as though Curtis, a 23rd round pick out of Junior College, will have a chance to play daily while Pav is on the mend. If Curtis continues to hit well and his defense is solid, don’t expect Pav to make the move back to first soon. The entire Cal State Fullerton student body is currently on Spring Break. The Titans do not have a mid-week non-conference game this week and will continue Big West Conference play this weekend up at Cal Poly San Luis Obisbo. Cal Poly swept Cal State Northridge and is the class of the Big West after just one weekend. Please note the late start time on Saturday. The 8 pm start is because the game will be televised on ESPNU.